As I prepare to move into a new home with my boyfriend, I’ve been feeling really domestic, and I wanted to share some of my tips for the home with you. I like to put a moist paper towel over my frozen meat when I microwave. The moisture from the towel helps steam the meat. Of course, when you’re heating pastas and other sauce-drenched foods, a towel is the difference between sauce exploding all over the microwave and a contained, warm bowl of food. A home is not a home until you own Sriracha, Crystal Louisiana Hot Sauce and Tapatio. A pasta strainer also makes a lovely fruit bowl. 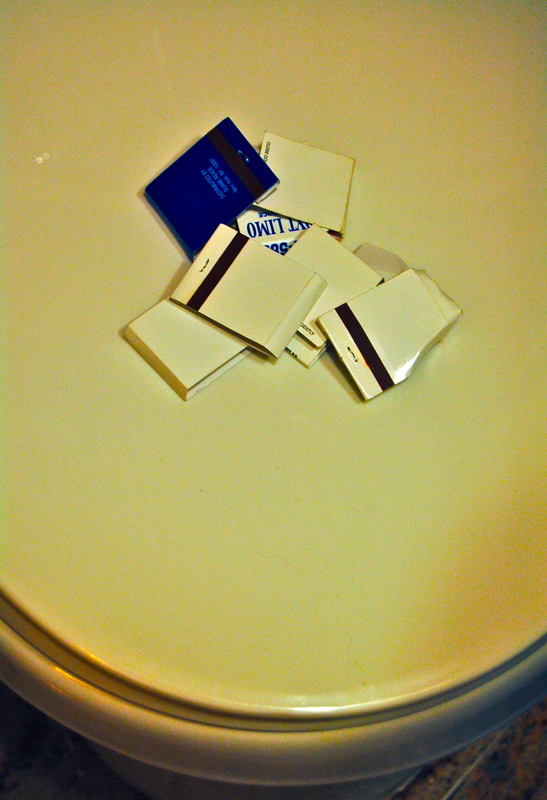 Collect matchbooks from your favorite bars and display them on the back of your toilet: a decorative way of letting people know you have a social life and a cheap air freshener! Those Brita filters do NOT need to be changed as much as they tell you. Of course Brita wants you to replace them. That’s how they make their money! Change when you can taste (or see) the difference. Cupcakes do not need to be refrigerated. Refrigeration just dries them out. There really is no need to fold clothes. What’s wrong with wrinkles? If anything, there’s something wrong with no wrinkles. What, are you a Republican? There’s also no need to separate whites and colors if you wash everything cold. However, if you really need to sterilize your clothes (perhaps because of a yeast infection) then washing them in hot water is advisable. There’s no need to shower every day. Your hair will look better with a little oil in it. Everyone loves a bowl of gummy worms out on your coffee table. Even if no one eats them, the presence of candy will make you seem fun and loving. What a hostess! Before company comes over, hide the underwear you were drying on a clothes wrack in the living room. That’s the polite thing to do. Why not make a necklace made of cat hair? If you don’t have air conditioning, the bathroom floor is always a cool place. Take off your clothes, sit in the bathtub and sip on a nice cold beer. Do not display your DVD, books or records unless you’re confident that your collection represents who you are as a person. Otherwise, you will find yourself saying things like “That was a gift!” and “No, I haven’t read it yet” to anyone who enters your home. Olive oil does eventually go bad. This surprised me because I thought a lot of ancient tombs (Etruscan or Egyptian?) had olive oil in them. Plants have to be watered. Even if it’s a cactus. You can make strawberry shortcake by crumbling up Marie Callendar’s frozen pie crusts. Delicious! Parmesan cheese will punch up the flavor of your guacomole and save you money on avocadoes. Accept that you have a lot to learn about adulthood and the customs of homemaking. Funny girl. Is all this blogging slowing down your dusting? Congratulations on the BIG move. Are the parents angsting? I mean, more than usual. I’m still in Idaho after Simon’s wedding to Jenny. It was great! But enough of that. I don’t want to appear to be pressuring you now that you are dispensing homemaker and how to fake being grown-up advice (not that any of us have learned how NOT to fake it!). Good luck, and remember, whenever you find out you’re having company and there’s no time to clean…..use your car. Stuff it full with everything you can’t fit into closets or drawers. It’s a lifesaver! Why thank you and congrats on the wedding!! I will definitely take the car technique into consideration. I like it.